AT76C503A based FastVNET USB 11M Network Adapter. There are drivers for Windows 98SE, ME, 2000 and XP included in this download. 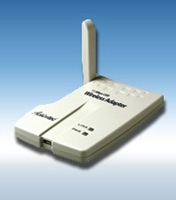 This software installs the Wireless LAN Monitor Utility for configuring the 11Mbps Wireless UISB Adapter (802UAT1). This Utility should be installed for systems running Windows 98, ME and 2000, but it is not for use on XP. When the 802UAT1 is installed on XP it should be managed using the built in XP utility. This is the ISO file (CD image) for the 11Mbps Wireless USB Adapter (802UAT1) CD v1.1. User Manual - 802UAT1 11Mbps Wireless USB This is the User Manual for the 11Mbps Wireless USB Adapter (802UAT1). 802UAT1 USB Driver Installation Instructions Instructions for downloading and installing the 11Mbps Wireless USB Adapter (802UAT1).